Karachi to Quetta, Pak Govt failured to give security to civilians and tame terrorist outfits. 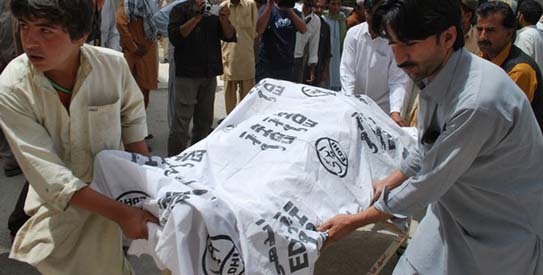 QUETTA|| Dawn News || 21-03-2011 : A security official says gunmen have attacked a camp for road construction workers in an area of Balochistan where rebels are active, killing 11 people. Azittalah said the attack late Monday took place close to the port town of Gwadar. Azittalah, who heads a tribal security force, says four attackers hit the camp before fleeing on motorbikes. Azittalah, who goes by a single name, did not identify the victims, though many laborers in Balochistan are settlers. Karachi—At least six more people, most of them political workers, were shot dead on Sunday in ongoing violence spree in the city, bringing the dead toll in politically-motivated killings to 18 in past 24 hours yesterday. 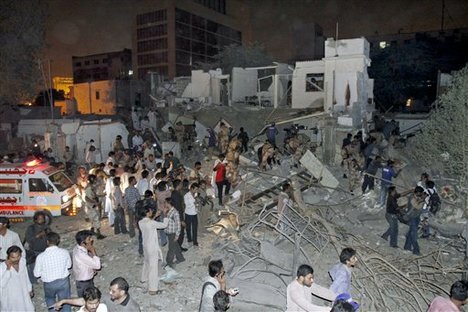 According to details, some 6 people were reportedly killed in the mega city within one hour in separate incidents. The unrest gripped Kharadar, Lyari, Orangi Town, Gulistan-e-Jauhar, Gulshan-e-Iqbal, Liaqat Abad, Burns Road and others areas of the city after a week-long incidents of shootout. Three policemen were targeted by miscreants in the city as police force and law enforcement agencies seemed to be helpless before the ghost attackers who easily targeted people and fled the scene successfully. On Sunday, unknown attackers riding a bike opened fire on two people in Kharadar area, killing one of them on the spot while the other died on way to hospital. A MQM worker, Shehzad was gunned down near Mosmiat area at Gulistan-e-Johar. In the same area, police found dead body of a man from a nullah. He was not identified. Meanwhile, in Gulshan-e-Iqbal, two people were killed and at least four injured when unidentified armed men targeted them on a shop. In another incident, unknown bikers hurled a hand grenade on local office of the Muttahida Qaumi Movement at Aram Bagh area, but it did not explode. Police said the grenade was defused. MQM has blamed criminal elements of People’s Aman Committee for targeting its workers, alleging Pakistan People’s Party for backing the group. PPP’s Sindh Home Minister had initially announced his support for the group, before Sindh government’s decision to close all the offices of the organization in the province following President Asif Ali Zardari’s high-level talks with MQM leadership. According to more details: In Teen Hatti area, an exchange of fire between protestors and the Rangers resulted in the killing of a youth named Danish. Armed men opened fire and injured six people near Disco Bakery in Gulshan-e-Iqbal. Two of the wounded later died while the other four were stated to be in critical condition. Two MQM workers were gunned down in Agra Taj Colony and Gulbahar. Another political worker who got injured earlier in Gulastan-e-Jauhar succumbed to his injures. A body was also recovered from the same area. In another incident, a policeman named Arshad Kundi was murdered in Sohrab Goth and a tent-house owner was shot dead on Burns Road. Bomb Disposal Squad defused a hand grenade found near Aaram Bagh mosque in the same locality. In Surjani Town and Mehmoodabad, two people were gunned down. Angry mobs, while protesting against target killings and extortion, burned tyres and blocked main arteries in Liaqatabad, Burns Road, Nazimabad, Lasbela Chowk and other areas. Miscreants torched three vehicles including two buses in Gulastan-e-Jauhar, Gulshan-e–Iqbal and Orangi Town. MQM leader Farooq Sattar has urged President Zardari to take notice of the fresh wave of killings in the city. He held Sindh Home Minister Zulfiqar Mirza responsible for the wave of violence in the city, but said he was not directly involved in the unrest. Talking to media persons, MQM leader Waseem Aftab urged Chief Justice Iftikhar Mohammad Chaudhry to take suo motu notice of the Karachi killings. Courtesy : Dawn | Pak Observer | AFP | Agencies.